The UV-1450 COLOR COMPORT RADI0METER AND DOSIMETER is a self-contained, high quality UV measuring instrument. With these four different UV-bands most of the measuring requirements of UV curing applications can be covered. Due to its three different UV sensors and the integrated microprocessor the UV-1450 COLOR ComPort Radiometer + Dosimeter can measure, record and display the peak of the UV-intensity (mW/cm2) for each UV-band individually plus the peak of total UV energy. Additionally, this instrument is calculating the UV-dosage (mJ/cm2) of the UV energy supplied during the time of exposure of one measuring cycle. The UV-dosage is calculated for each UV-band (UV-A, UV-B, UV-C and UV-V) individually and as total Integral of UV-dosage over the full UV-range. This allows to determine not only the total energy, but also how that energy is delivered, i.e., what intensity and dose at what UV-band. *This instrument features a selectable triggered mode, i.e. the 30 sec recording cycle starts within a 120 second readiness phase not before the incident UV-intensity exceeds 2 mW/cm. The four sensors are on the back of the unit which also serves as a heat shield. After completion of the measuring cycle the measuring results are instantly displayed numerically and graphically auto-scaled on the built in 45 x 34 mm (1.75 x 1.3) TFT COLOR display. A special AUTO-OFF feature that turns off the unit automatically after one minute serves as energy saving and extension of the battery service life. 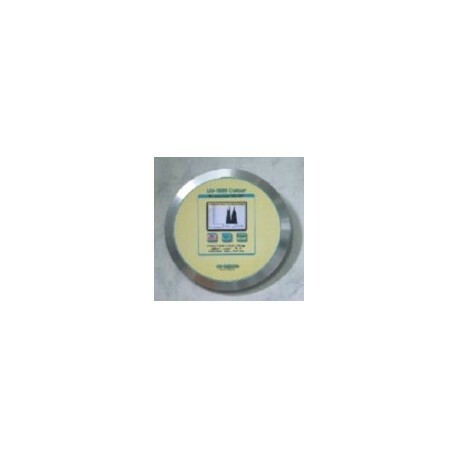 While on the conveyer belt, the UV-1450 COLOR ComPort Radiometer + Dosimeter can withstand max.